White card baby lying underneath a quilt decorated with baby toys, sun, hearts, stars, ducks, balloons, etc. White flat card with baby boy or baby girl items in corners. 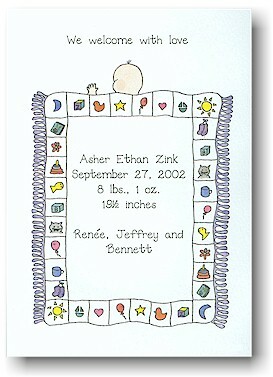 Baby boy card is decorated with light blue dots and checkmarks. Baby girl card has pink dots and checkmarks.